After a few days in Yangon, we hopped on an overnight bus north to Bagan. Bagan is an ancient city in which over 10,000 Buddhist temples, pagodas and monasteries were built between the 11th and 13th centuries, and according to the trusty Wikipedia, the remains of over 2200 of them still stand. We parked ourselves at a resort there called the "Amazing Bagan Resort". Clever name, eh? We were super stoked about the idea of a pool after walking in the sweltering heat of Yangon. Unfortunately, we failed to consider the fact that the pool water would actually be too warm to cool off in. Doh! Nevertheless, it was relaxing to sit poolside and enjoy the 60's style glamour of the resort. I was thinking Don Draper would pop a squat in the chair next to me at any moment. 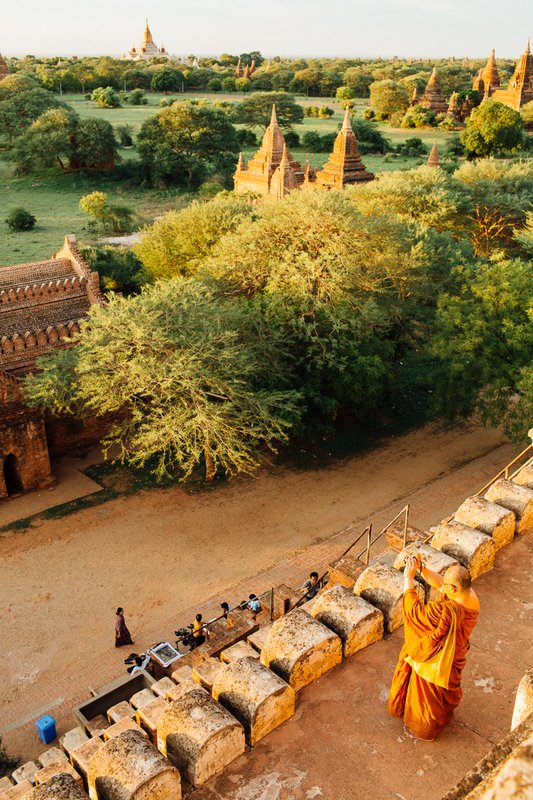 The main thing to do in Bagan is to catch sunrises and sunsets from atop one of the pagodas looking over all the other pagodas, and I believe we managed to catch one sunrise and two sunsets while we were there. We also rented an "e-bike" (aka a scooter too weak to be called a scooter), and as you can see in the picture, Adam fit on it just perfectly. Wink. One of my favorite parts about Bagan though was that we met some new friends! Alina and Kieran, a Russian and Irishman from San Francisco, are on a one-year hiatus from work and have been traveling around the world together for six months already. Since meeting them in Bagan, we've been traveling along together and meeting up here and there throughout Myanmar and Thailand, and it's been so nice to have a bit of companionship along the way!